Demonstrators say president lacks popular support in Taiwan for summit and worry he will make secret deal that sacrifices Taiwan’s prized democracy and self-rule to China. As Taiwanese President Ma Ying-jeou shook hands with his counterpart from China Saturday in Singapore, about 400 people marched in downtown Taipei Saturday to protest the first-ever meeting between the long-time political enemies. Demonstrators said Ma lacked popular support at home for the summit and worried that he would make a secret deal during the meeting with Chinese President Xi Jinping. Many feared the two leaders would reach a private agreement that sacrifices Taiwan’s prized democracy and self-rule to China, which has long demanded the two sides unify. Leaders from Taiwan and China had never met before as decades of icy relations had kept tensions running high. In the days leading up to the historic meeting, Ma said no deals would be signed. Lin Mu-shun, a 21-year-old university student from Taipei, said he is concerned the summit will lead to economic integration first. Lin said he is worried Taiwan and China will become the same country, because he feels that China considers their race and culture basically the same. He suspects that economic unification will come first and that the topic might have been raised today, adding that he is quite scared. China has considered Taiwan part of its territory since the Chinese civil war of the 1940s. An activist protests against the Singapore meeting between Taiwan's President Ma Ying-jeou and China's President Xi Jinping while police officers stand guard outside the Ministry of Economic Affairs in Taipei, Taiwan, Nov. 7, 2015. Opinion surveys indicate most Taiwanese prefer today’s self-rule over China’s long-term goal of unification. Officials in Taipei and Beijing shelved those differences in 2008 to begin exchanges at lower levels of government. Since that year, they have signed 23 agreements, mostly covering trade, transit links and investment. Ma expressed discontent about weapons apparently aimed at Taiwan and frustration that Beijing is blocking the island's foreign affairs. China has used its economic might to win more than 170 diplomatic allies, compared to Taiwan’s 22, and to bar the island from joining international organizations. Protesters chanted for an end to the meeting and for stopping unrelated negotiations on a China-Taiwan deal that would cut import tariffs. A protest leader warned from a stage that the summit is taking place on conditions that both sides belong to a single China. 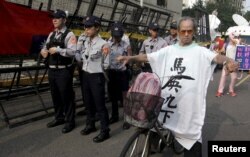 Dozens protested outside parliament in Taipei Friday night and Saturday and a few were arrested for trying to break in. Three university-aged Taiwanese also flew to Singapore where they planned to protest the summit at Taiwan’s de facto embassy in the city-state. Many in Taiwan wonder whether the summit, held just seven months before Ma must leave office due to term limits, was geared to influence elections in January. The ruling Nationalist Party is running behind the anti-China opposition candidate for president in opinion polls. But Taipei has seen much larger political demonstrations, and many cautiously support the China-Taiwan meeting. They suggest it could reduce the threat of war and give each side a better grasp of the other’s agenda. Ma told Xi in Singapore he hoped to set up a hotline and strengthen overall communication. He said earlier in the week that China-Taiwan summits should become regular events.